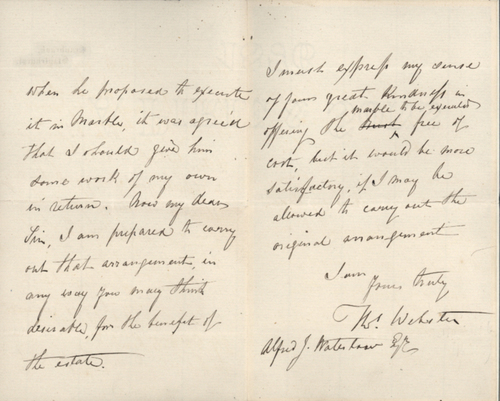 Autograph Letter Signed, to Alfred J.Waterhouse, about Webster sitting for a plaster bust by Mr. Denham, and the completion of the commission. 3 pp. 7 x 4½ inches, in good condition. Cranbrook, Staplehurst, 16 December 1877. Thomas Webster (1800-1886), painter, frequent exhibitor at the Royal Academy. His pictures are well known from engravings. His father was a member of the household of George III; and the son, having shown an aptitude for music, became a chorister in the Chapel Royal, St James’s. He, however, developed a still stronger love for painting, and in 1821 he was admitted student of the Royal Academy, to whose exhibition he contributed, in 1824, portraits of “Mrs Robinson and Family.” In the following year he gained the first medal in the school of painting. Till 1879 he continued to exhibit in the Royal Academy work of a genial and gently humorous character, dealing commonly with subjects of familiar incident, and especially of child life. Many of these were exceedingly popular, particularly his “Punch” (1840), which procured in 1841 his election as ARA. Webster was leader of a group of artists who called themselves “The Cranbrook Colony”.